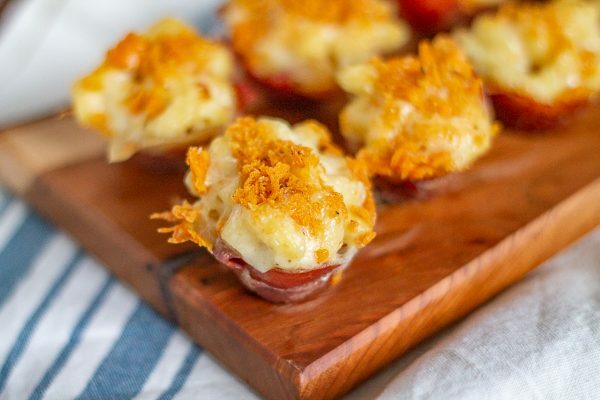 These prosciutto wrapped mac and cheese bites topped with Cheez-It crumbs are a perfect and easy Super Bowl snack. The best part of the Super Bowl is the food. 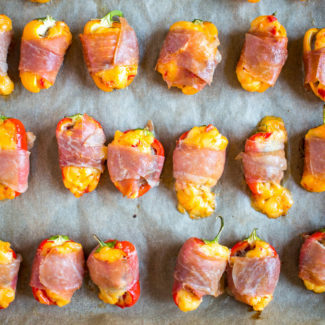 Super Bowl snacks seem to have one major requirement: cheese. This is perfect for me since cheese is my favorite food. Inspired by cheese, and the upcoming game-day, I created these mac and cheese bites. My goal was to make macaroni and cheese bites that were just the right size, easy to make, and easy to get out of the pan. Just putting macaroni and cheese into a cupcake tin tends to result in a mess. You need to put the macaroni and cheese in some sort of vessel so that it will come right out of the pan. 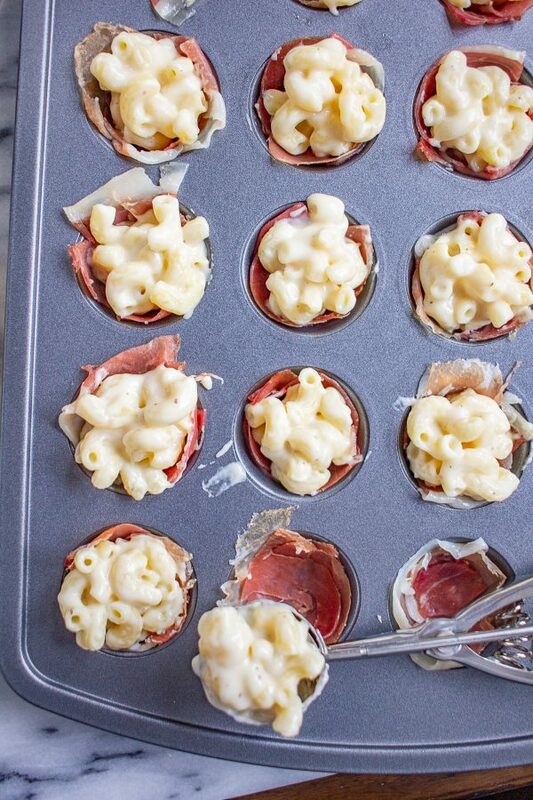 It is easy to make prosciutto cups, and they contain the macaroni and cheese perfectly. Most importantly, they slide right out a non-stick pan. I used an un-greased non-stick pan. The prosciutto has just enough fat that you don’t need to grease the pan. 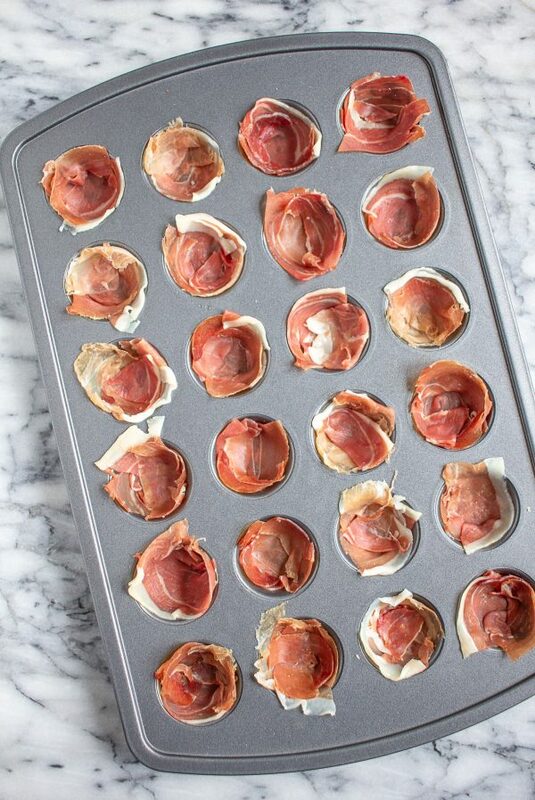 About 1/3 of a slice of prosciutto will fit nicely into the bottom of a mini cupcake tin. The only rule is to completely cover all of the space in each cupcake cup. I know that it might be tempting to use bacon instead of prosciutto, but don’t. Bacon is too fatty and wouldn’t cook quickly enough. Prosciutto works perfectly. 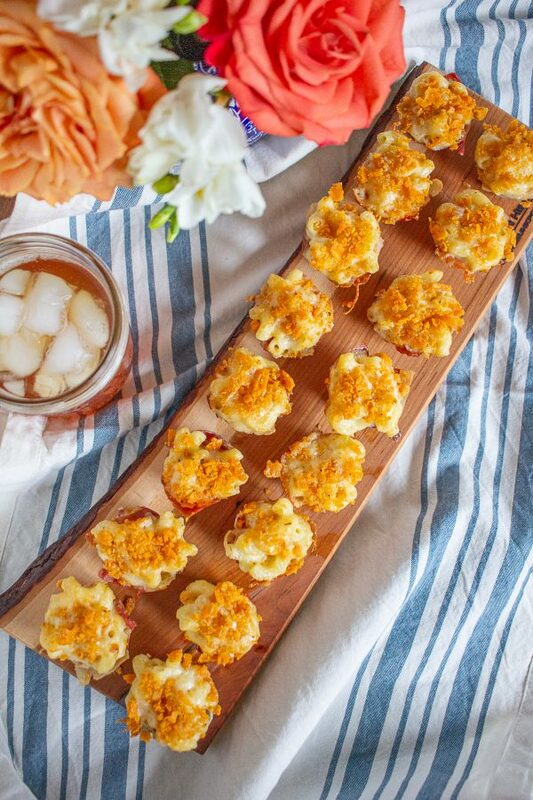 You can use any macaroni and cheese recipe to make these macaroni and cheese bites. 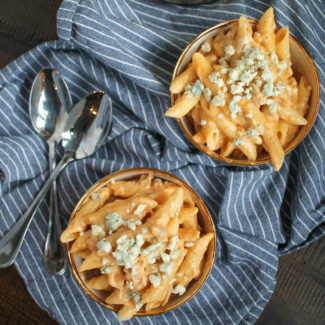 I made a quick and easy stovetop macaroni and cheese using Cabot Cheddar. I am a huge fan of Cabot, and I used their Private Stock Cheddar for this recipe. They didn’t sponsor this post, but I have worked with the brand recently, and their cheese is my go-to. The Private Stock has a bold sharpness and a creaminess that make the cheese ideal for mac and cheese. The macaroni and cheese has just a touch of salt in it. If you taste test it, you might be tempted to add more salt, but don’t. 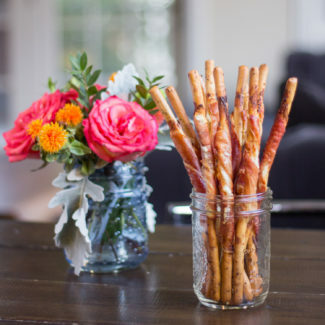 The saltiness of the prosciutto and Cheez-It crumbs will add enough salt to this snack. 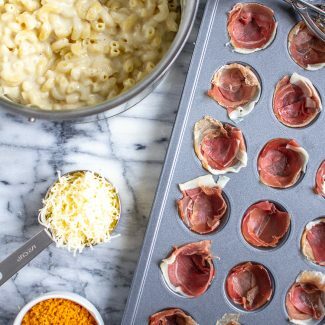 There is no need to precook the prosciutto, just scoop the macaroni and cheese right into the prosciutto cups, filling them all the way. Then add a little extra cheddar and some Cheez-It crumbs on top. You could skip the Cheez-It crumbs, but I like the added bit of crunch. 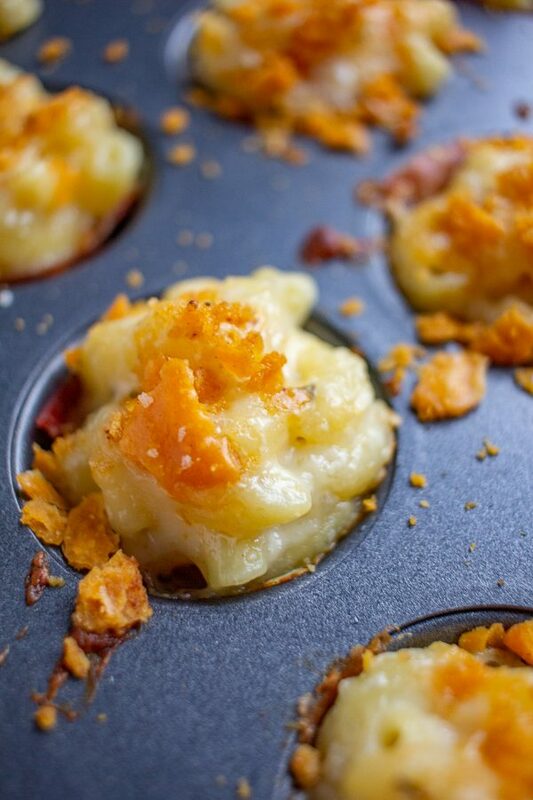 Once assembled, the mac and cheese bites go into the oven for just 15 minutes. 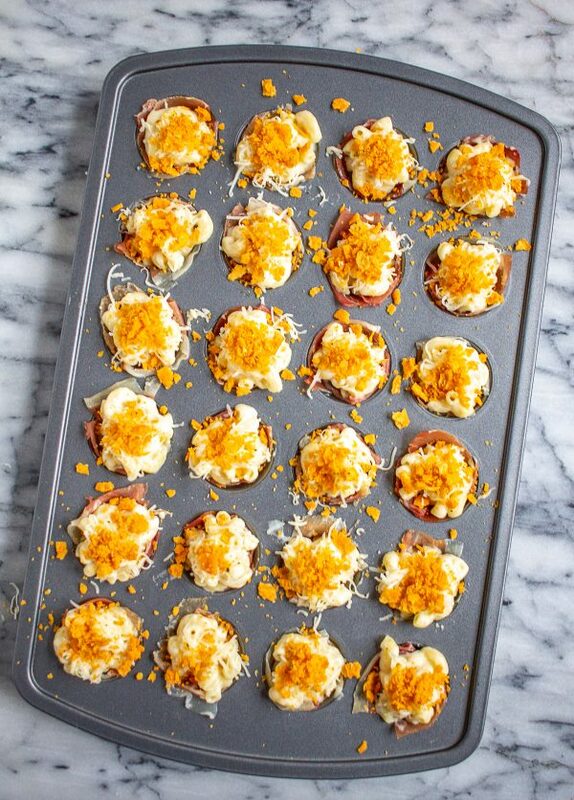 If you are having a party you can prepare the macaroni and cheese bites in advance and then bake them later. In that case, you will want to slightly increase the cook time since the macaroni and cheese won’t be warm when they go into the oven. 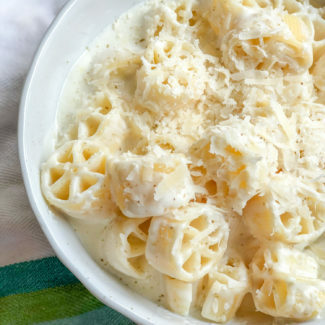 This recipe makes about 40 macaroni and cheese bites. I made one batch of 24 macaroni and cheese bites because I only have one mini cupcake tray, I did have plenty and macaroni and cheese left over. 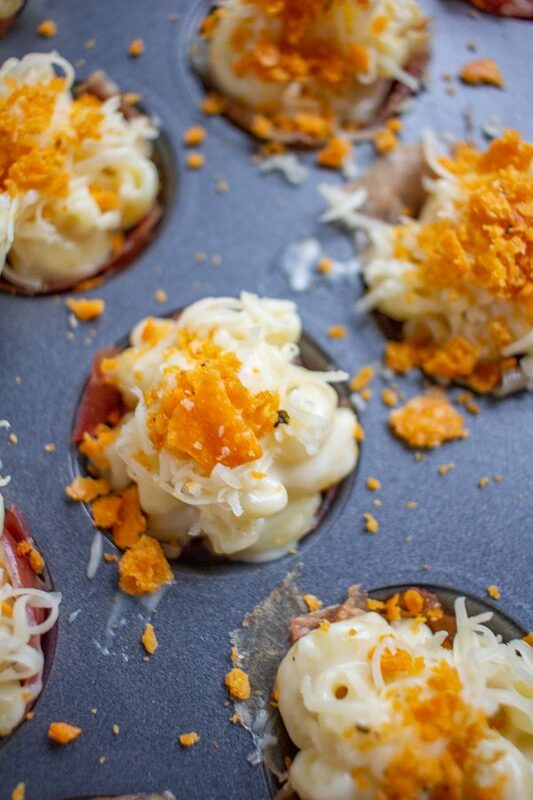 These prosciutto wrapped mac and cheese bites topped with Cheez-It crumbs are a perfect and easy Super Bowl snack. 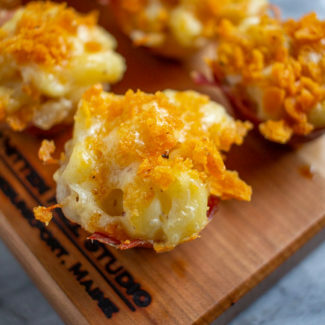 To prepare this recipe, fill a mini cupcake tray with proscuitto, fill with macaroni and cheese, and top with Cheez-It crumbs. The total preparation time is under an hour! 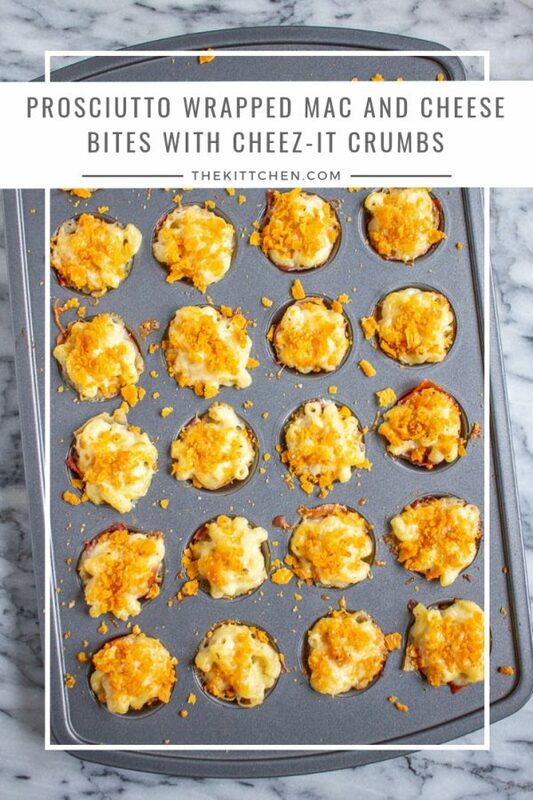 1/2 cup of Cheez-Its crushed into crumbs. Put a pot of water on to boil and heat your oven to 375 degrees. 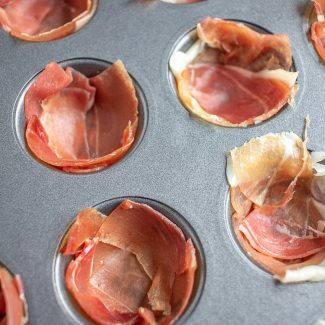 While you are waiting for the water to boil, line a mini cupcake tray (or two if you have two) with prosciutto. I found that cutting the prosciutto into thirds with kitchen shears was a good way to do this. Fill all of the space in each individual cup, cutting small pieces of prosciutto to fill holes. Gently press the prosciutto into the cups so it holds its shape. By now your water should be boiling. Add your pasta and cook until a little extra al dente. Rinse the pasta in cold water. I don't usually rinse my pasta, but in the case, you want to add cold pasta to the cheese cause. 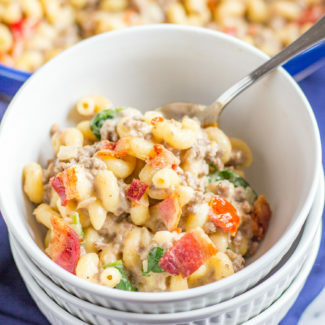 This prevents the pasta from soaking up too much of the sauce - you don't want dry mac and cheese. Set the pasta aside. In a small skillet, melt 2 teaspoons of butter over medium low heat. Add the crushed Cheez-Its and toss them in the butter, and let them toast for 30 seconds. Set aside. Now you want to prepare the cheese sauce. In a medium sized pot, melt 1 tablespoon of butter over medium heat. Once melted, whisk in the butter. Let the butter and flour cook together for 1 minute, then whisk in the milk. Whisking frequently, bring the milk to a slow and steady boil. One it beings to boil, let thicken for 1 minute while whisking. Whisk in the mustard and cubed cheddar cheese. Season with a dash of salt and pepper. Once the cheese has melted and the sauce is smooth, stir in the pasta. 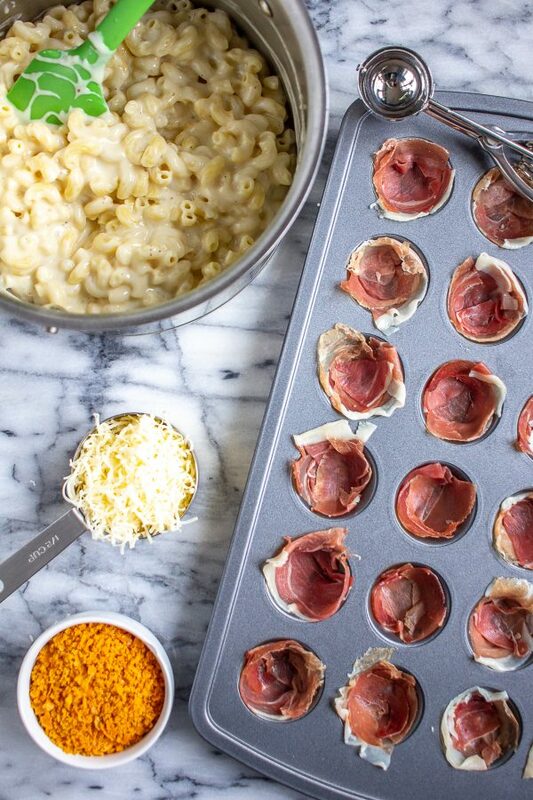 To assemble the mac and cheese bites, spoon macaroni and cheese into the prosciutto cups, filling them to the top. Sprinkle some of the shredded cheddar and the Cheez-It crumbs on top. Bake for 15 minutes at 375 degrees. Then remove from the cupcake tin and serve right away. Resist the urge to eat them all yourself. 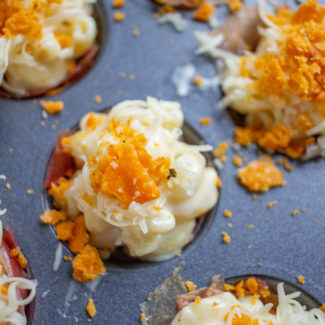 Once assembled, the mac and cheese bites go into the oven for just 15 minutes. 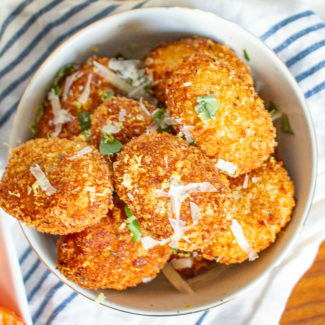 If you are having a party you can prepare the macaroni and cheese bites in advance and then bake them later. In that case, you will want to slightly increase the cook time since the macaroni and cheese won't be warm when they go into the oven. I used a mini cupcake tin for this recipe. 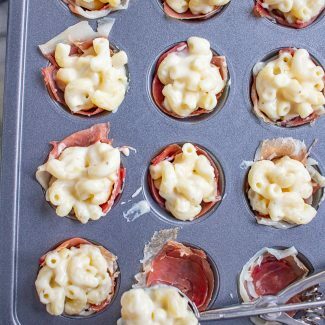 If you want to make full sized cupcakes instead, I would recommend pre-cooking the prosciutto cups for 5 minutes just so that they are extra crisp and sturdy so they can hold more macaroni and cheese.